Gerhard Fritz Kurt Schröder (born April 7, 1944), German politician, was Chancellor of Germany from 1998 to 2005. A member of the Social Democratic Party of Germany (SPD), he led a coalition government of the SPD and the Greens. Before becoming a full-time politician, he was a successful lawyer, and before becoming Chancellor he was Minister-president of the German state of Lower Saxony. Following the 2005 federal election, which his party lost, after three weeks of negotiations he stepped down as Chancellor in favor of Angela Merkel of the rival Christian Democratic Union, who became Germany's first female head of government. He then became head of Nord Stream AG, the company building the Russian-German gas pipeline. Largely as a result of German reunification and the poor economic situation of the East, unemployment was a major issue throughout Schröder's seven year Chancellorship. Failure to reduce unemployment after promising to do so was the main cause of his electoral defeat in 2005, after which he was unable to form a new government. Schröder enjoyed popularity, however, for his opposition to the 2003 invasion of Iraq. He also championed Germany's right to a permanent seat on the United Nations Security Council and increased German participation in peace-keeping missions around the globe. His close ties with Russia alienated other East Europeans. Schröder started a process whereby Germany, after having been excluded from a role in maintaining global security because, with Japan it was regarded as a potential threat, is re-asserting a leading role in world affairs as what has been described as a "civilian power," not as a military power. In this perspective, as the world community matures, diplomacy and negotiation must replace use of force not only in resolving disputes but also in pursuit of the goal of global security. Schröder wanted to strengthen Germany's role in the world by establishing what he regarded as "co-leadership" alongside other powers. Schröder (often spelled "Schroeder" in English) was born in Mossenberg, in what is now North Rhine-Westphalia. His father, Fritz Schröder, a lance corporal in the Wehrmacht, was killed during World War II in action in Romania on October 4, 1944, a few months after Gerhard's birth. His mother Erika worked as an agricultural laborer in order to support herself and her two sons. Schröder completed an apprenticeship in retail sales in a Lemgo hardware shop from 1958 to 1961, then worked in a retail shop in Lage and after that as an unskilled construction worker and sales clerk in Göttingen while studying at night school to gain a high school diploma. Still trying to a place at a university, in 1966 Schröder passed the Abitur test at Westfalen-Kolleg, Bielefeld. From 1966 to 1971 he studied law at the University of Göttingen. From 1972 onwards, Schröder served as an assistant at Göttingen University. In 1976 he passed his second law examination; he worked as a lawyer until 1990. Schröder joined the Social Democratic Party in 1963. In 1978 he became the federal chairman of the Young Socialists in the SPD Young Socialists, the youth organization of the SPD. He spoke for the dissident socialist organizer Rudolf Bahro who had been arrested in 1977, as did U.S. Pres. Jimmy Carter, philosopher Herbert Marcuse and Wolf Biermann. In 1982 he wrote an article on the idea of a red/green coalition for a book at Olle & Wolter, Berlin, which later appeared in "Die Zeit." SPD- and SI-Chairman, Chancellor Willy Brandt, who reviewed Olle & Wolter at that time, had just asked for more books on the subject. In 1980 Gerhard Schröder was elected to the German Bundestag, and wore a sweater to parliament instead of the traditional suit. He became chairman of the SPD Hanover district. 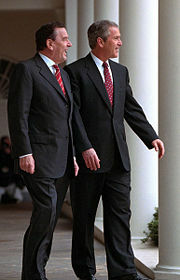 In 1985 Schröder met with East German leader Erich Honecker during a visit to East Berlin. In 1986 Schröder was elected to the parliament of Lower Saxony and became leader of the SPD group. After the SPD won the state elections in June 1990, he became Minister-President of Lower Saxony as head of an SPD-Greens coalition; in this position, he also won the 1994 and 1998 state elections. Following his election as Minister-President in 1990, Schröder became a member of the board of the federal SPD. In 1997-1998 he served as President of the Bundesrat, but he left the office on October 27, three days before his term expired, when he became Chancellor as head of an SPD/Green coalition. At the September 22 2002 general elections, he secured another four-year term, with a narrow nine-seat majority (down from 21). Schröder in Esslingen. "SPD - Trust in Germany"
After the resignation of Oskar Lafontaine as SPD Chairman in March, 1999, in protest at Schröder's adoption of a number of what Lafontaine considered "neo-liberal" policies, Schröder took over his rival's office as well. In February, 2004, he resigned as chairman of the SPD. Franz Müntefering succeeded him as chairman. On May 22, 2005 after the SPD lost to the Christian Democrats (CDU) in North Rhine-Westphalia, Gerhard Schröder announced he would call federal elections "as soon as possible." A motion of confidence was subsequently defeated in the Bundestag on July 1, 2005 by 151 to 296 (with 148 abstaining), after Schröder urged members not to vote for his government in order to trigger new elections. The 2005 German federal elections were held on September 18, 2005. After the elections neither Schröder's SPD-Green coalition nor the alliance between CDU/CSU and the FDP led by Angela Merkel achieved a majority in parliament, but the CDU/CSU had a stronger popular electoral lead by one percentage point. Since the SPD had been trailing the CDU by more than 15 points only weeks before the election, this outcome was a surprise—and attributed to Schröder's charisma and prowess as a campaigner. Polls consistently showed that he was much more popular with the German people than Ms. Merkel. On election night, both Schröder and Merkel claimed victory and chancellorship, but after initially ruling out a grand coalition with Merkel, Schröder and Müntefering entered negotiations with her and the CSU's Edmund Stoiber. On October 10 it was announced that the parties had agreed to form a grand coalition. Schröder agreed to cede the chancellorship to Merkel, but the SPD would hold the majority of government posts and retain considerable control of government policy. Merkel was elected chancellor on November 22. Schröder announced on October 11 that he would not take a post in the new Cabinet, and in November he confirmed that he would leave politics as soon as Merkel took office. On November 23, 2005, he resigned his Bundestag seat, and later joined Ringier AG, the publisher of some of the leading newspapers and magazines in Switzerland and Europe, as a Zurich-based political consultant and lobbyist. 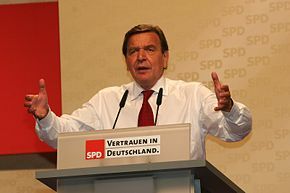 At the SPD conference in Karlsruhe on November 14, 2005 Schröder urged members of the SPD to support the proposed coalition, saying it "carries unmistakably, perhaps primarily, the imprint of the Social Democrats." Many SPD members had previously indicated that they supported the coalition, which would have continued the policies of Schröder's government, but had objected to Angela Merkel replacing him as Chancellor. The conference voted overwhelmingly to approve the deal. After the 2002 election, the SPD steadily lost support in opinion polls. Many increasingly perceived Schröder's Third Way (centrist) program to be a dismantling of the German welfare state. Moreover, Germany's high unemployment rate remained a serious problem for the government. Schröder's tax policies were also unpopular; when the satirical radio show The Gerd Show released Der Steuersong, featuring Schröder's voice (via impressionist Elmar Brandt) lampooning Germany's indirect taxation with the lyrics "Dog tax, tobacco tax, emissions and environmental tax, did you really think more weren't coming? ", it became Germany's 2002 Christmas No. 1 chart hit and sold over a million copies. 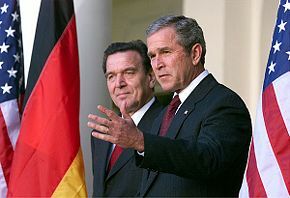 Unlike the 2002 election, which was largely won on his opposition of the impending United States-led invasion of Iraq, Schröder in 2005 campaigned primarily on domestic issues. Schröder focused on being anti-capitalistic and anti-intellectual. For example, he labeled the opposition's choice for the ministry of finance, Paul Kirchhof, "this professor from Heidelberg" in a derogatory manner. This won him a lot of support among many proletarians. Furthermore he focused on introducing new taxes for the rich. Despite knowing that this would hardly have an effect, Schröder believed it was necessary to win the election. The fact that Schröder served on the Volkswagen board (as minister-president of Lower Saxony) and tended to prefer pro-car policies led to him being nicknamed the "Auto-Kanzler" (car chancellor). Schröder sent forces to Kosovo and to Afghanistan as part of NATO operations. Prior to Schröder's Chancellorship, German troops had not taken part in combat actions since World War II. With Germany having a long experience with terrorism itself, Schröder declared solidarity with the United States after the September 11 terrorist attacks. When Schröder left office Germany had 2,000 troops in Afghanistan, the largest contingent from any nation other than the United States. Along with French President Jacques Chirac and many other world leaders, Schröder spoke out strongly against the war on Iraq, and refused any military assistance in that enterprise. Schröder's stance caused political friction between the U.S. and Germany, in particular because he used this topic for his election campaign. Schröder's stance set the stage for alleged anti-American statements by members of the SPD. The parliamentary leader of the SPD, Ludwig Stiegler, compared U.S. Pres. George W. Bush to Julius Caesar while Schröder's Minister of Justice, Herta Däubler-Gmelin, likened Bush to Adolf Hitler. Schröder's critics accused him of enhancing, and campaigning on, anti-American sentiments in Germany. On August 1, 2004, the 60th anniversary of the 1944 Warsaw Uprising, he apologized to Poland for "the immeasurable suffering" of its people during the conflict. He was the first German chancellor to be invited to an anniversary of the uprising. In addition to a friendly relationship with Jacques Chirac, Schröder cultivated close ties with Russian President Vladimir Putin, in an attempt to strengthen the "strategic partnership" between Berlin and Moscow, including the opening of a gas pipeline from Russian Andrew Marino-Pipelines over the Baltic Sea exclusively between Russia and Germany. Schröder was criticized in the media, and subsequently by Angela Merkel, for calling Putin a "flawless democrat" on November 22, 2004, only days before Putin prematurely congratulated Viktor Yanukovich during the Orange Revolution in the Ukraine. Only a few days after his chancellorship, Schröder joined the board of directors of the joint venture, thus bringing about new speculations about his prior objectivity. In his memoir, Decisions: My Life in Politics, Schröder still defends his friend and political ally Putin, and states that "it would be wrong to place excessive demands on Russia when it comes to the rate of domestic political reform and democratic development, or to judge it solely on the basis of the Chechnya conflict." The former chancellor has criticized the decision of some European countries to swiftly recognize Kosovo as an independent state after the breakaway Serbian province declared independence in February 2008. Schröder, who says that the EU countries who've recognized Kosovo did so under heavy pressure from the U.S. government, believes that Western recognition has caused more problems, including weakening the so-called pro-EU forces in Serbia. In August 2008, Schröder went even further, laying blame for the 2008 South Ossetia war squarely on Mikhail Saakashvili and "the West," hinting at American foreknowledge, and refusing to criticize any aspect of Russian policy which had thus far come to light. Schröder advocated a German seat on the United Nations Security Council. His government "also lobbied for more voting power within the European Union, and warned partners that it was no longer prepared to pay a disproportionate amount into the EU budget." Schröder's four marriages have earned him the nickname "Audi Man," a reference to the 4-ring symbol of Audi motorcars. Another nickname is "The Lord of the Rings". Doris has a daughter Klara-Marie (born 1991), who lives with the couple, from a previous relationship with a TV journalist. When not in Berlin, he lives in Hanover. In July 2004 he and his wife adopted a child named Viktoria from Saint Petersburg in Russia. In 2006 they adopted a boy Gregor from the same city. Schröder identifies himself as a Protestant, but does not appear to be religious. He did not add the optional phrase So wahr mir Gott helfe formula (so help me God) when sworn in as chancellor for his first term in 1998. As Chancellor, Gerhard Schröder was a strong advocate of the Nord Stream pipeline project, which aims to supply Russian natural gas directly to Germany and thereby bypassing transit countries. The agreement to build the pipeline was signed two weeks before the German parliamentary election. On October 24, 2005, just a few weeks before Schröder stepped down as a Chancellor, the German government guaranteed to cover 1 billion euros of the Nord Stream project cost, should Gazprom default on a loan. However, this guarantee had never been used. Soon after stepping down as chancellor, Schröder accepted Gazprom's nomination for the post of the head of the shareholders' committee of Nord Stream AG, raising questions about a potential conflict of interest. German opposition parties have expressed concern over the issue, as have the governments of countries over whose territory gas is currently pumped. In an editorial entitled "Gerhard Schroeder's Sellout," the American newspaper Washington Post has also expressed sharp criticism, reflecting widening international ramifications of Schröder's new post. Democrat Tom Lantos, late chairman of the United States House Committee on Foreign Affairs and holocaust survivor, likened Schröder to a "political prostitute" for his recent behavior. During a heated dispute between Russia and Estonia in May 2007 over the removal of a Soviet-era war memorial from the center of the Estonian capital, Tallinn, to a military cemetery Schröder defended the Kremlin's reaction. He remarked that Estonia had contradicted "every form of civilized behavior". Consequently, the Estonian government canceled a planned visit by Schröder in his function as chairman of Nord Stream AG. In evaluating Schröder's political legacy, John Vinocur suggests that he failed to deliver the turn-around in the German economy that the nation needed. The highlight of his seven years may have been his popular opposition to the war in Iraq. However, "in two polls, one commissioned in August by the political review Cicero, the other last year by the ZDF television network, Schröder got one percent of the vote for the "most significant German chancellor" in first poll and, in the second, finished 82nd out of a group of '100 best Germans,' a good 50 places behind every other chancellor that figured in the group." On the other hand, under his leadership, "Schröder's Germany attacked no one, in no way behaved undemocratically, or seriously scared its neighbors with outbreaks of intolerance or irrationality." His close relationship with Russia tended to alienate others in East Europe. Assessing his career, the BBC identifies the "conspicuous failure of his chancellorship" as his failure to reduce unemployment. The number of jobless Germans reached 5 million for the first time in February, 2005. Schröder was the "first German chancellor whose life, or whose youth, was not dominated by World War II" and one important "development under his chancellorship" was "Germany's new readiness" to take a leading role on the global stage, joining "peace keeping operations in Kosovo and Macedonia, and combat operations in Afghanistan". Germany's self-understanding of its role as a civilian power represents an alternative approach to that of the United States, for example. Thus, "While German foreign policy strives to tame power politics by strengthening international law and building trust and confidence among states as part of an ideology of exporting the positive experiences of Europeanization to the world-stage, the U.S. is more willing to follow security rationales, to apply military means and to define problems in terms of a state of exception if it comes to think that a vital security concern is at stake." Germans, says Hellmann discussing George W. Bush's relationship with Schröder, "still cherish the thought of being a 'civilian power' … The belief that it is possible to settle most conflicts via negotiations is deeply ingrained." ↑ A civilian power transfers "the processes and institutions that have civilized politics and society domestically to the international level." Thus, "In particular, civilian Power is concerned with the legitimacy of the international order" and advocates "participatory forms of decision making." (Sebastian Harnisch, Hanns Maull), 10-11. A Civilian Power uses diplomacy and negotiation as the preferred method to resolve disputes. ↑ 2.0 2.1 Gunther Hellmann, Feb 22, 2005. American needs meet German ambitions: President Bush in Germany. International Herald Tribune Retrieved September 18, 2008. "Washington is looking for "partners." Chancellor Gerhard Schröder, by contrast, seeks 'leadership' - "at eye level," as he likes to add. From the vantage point of Berlin, the trans-Atlantic crisis over Iraq was first of all the result of insufficient consultation within NATO and Washington's lack of respect for its traditional allies." ↑ This is the test that triggers University admission. ↑ Merkel named as German chancellor. BBC News. Retrieved September 18, 2008. ↑ German parties back new coalition. BBC News. Retrieved September 18, 2008. ↑ Gerhard Schroeder's Dangerous Liaison. Der Spiegel Retrieved September 18, 2008. ↑ It Would Be Wrong to Place Excessive Demands. Der Spiegel, 10/26/2006, Retrieved September 18, 2008. ↑ Schroeder: Kosovo recognition “against Europe’s interests.” B92-News. Retrieved September 18, 2008. ↑ Serious Mistakes by the West. Der Spiegel Retrieved September 18, 2008. ↑ Joshua Muravchick. 2005. The Future of the United Nations. (Washington, DC: American Enterprise Institute. ISBN 084477163X), 130. ↑ 12.0 12.1 12.2 Profile: Gerhard Schroeder. BBC News. Retrieved September 18, 2008. ↑ Kate Connolly, 2002. The Audi man. The Observer Retrieved September 18, 2008. ↑ January 18, 2003, "Profile: Doris Schroeder-Koepf" BBC News Retrieved October 3, 2008. ↑ Schroeder Takes Germany's Helm Social Democrat Sworn In As Chancellor Tuesday. CBS News. Retrieved September 18, 2008. ↑ Tobias Buck, and Bertrand Benoit, May 8, 2006, EU to probe German gas pipeline guarantee. Financial Times September 18, 2008. ↑ Schroeder attacked over gas post. BBC News. Retrieved September 18, 2008. ↑ Gerhard Schroeder's Sellout. Washington Post, A26. Retrieved September 18, 2008. ↑ Harry Dunphy, 2007. Lantos Raps Former European Leaders. Associated Press. Retrieved September 18, 2008. ↑ An ineffective bully. The Economist. Retrieved September 18, 2008. ↑ Holger Stritzel, October 13, 2006. German and American Perceptions of ‘Rogue States.’ American Institute for Contemporary German Studies AICGS Adviser. Retrieved September 18, 2008. 2001. "Gerhard Schroder's vision for Europe." ECONOMIST -LONDON- ECONOMIST-. 37. 2002. "Germany's election Gerhard Schroder clings on." ECONOMIST -LONDON- ECONOMIST-. 43. Acker, Kerry. 2004. Gerhard Schroeder. (Major world leaders) Philadelphia, PA: Chelsea House Publishers. ISBN 9780791076521. Dalton, R.J. 1999. Germany's Vote for a "New Middle" - With his promise of a brighter future, Gerhard Schroder was elected chancellor after 16 years of rule by Helmut Kohl. Now Germans—And the world—Await his solutions to unemployment and a fragile German economy. Current History 98 (627):176. Harnisch, Sebastian, and Hanns Maull. 2001. Germany as a civilian power? : the foreign policy of the Berlin Republic. (Issues in German politics) Manchester, UK: Manchester University Press. ISBN 9780719060410. Lafontaine, Oskar. 2000. The heart beats on the left. Cambridge, UK: Polity. ISBN 9780745625812. Reutter, Werner. 2004. Germany on the road to "normalcy": policies and politics of the Red-Green Federal government (1998-2002). New York, NY: Palgrave Macmillan. ISBN 9781403964397. Schröder, Gerhard, and Alfred Rapp. 1964. Decision for Europe. London, UK: Thames and Hudson. All links retrieved June 20, 2017. Profile: Gerhard Schroeder Gerhard Schroeder's career is a tale of rags to political riches, BBC News, July 2005. This page was last modified on 20 June 2017, at 20:17.